Recently me and my little sister moved into the trailer house on the ranch. She has decided we will not call it a trailer, it is a house, rather a home. So our new to us house was somewhat out dated. Our kitchen and bathrooms being the worst of the decor. Our kitchen had little flower/feather looking walls. We still aren't sure what to call them still. Either way they are gone and in the place of the terrible feather/flower walls are what we decided to call Green Tea Green. It was a light yellow and a turquoise that I mixed just playing around and we ended up loving it! 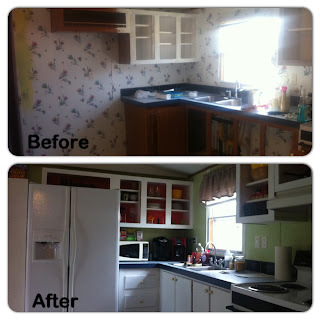 We painted the old faux wood cabinets white and took all the doors off of the top shelves. The counter tops we left the same and decided to add in a few accessories that were navy. We said it was because we thought it looked cute, but I think half the reason was because we were just tired of the whole project and ready to be done. We had a huge paint dilemma when it wouldn't cover the printed wall. It wasn't even wall paper, that was our walls. After three coats of paint and 5 attempts at finishing it we ended up with what we are calling our little Gingerbread House Kitchen in our "Hippie Hut." We are so pleased with how it turned out. We still have pretty much every other room to finish, but it is a work in progress and we are making progress. Our latest adventure is our gallery wall which we have decided not to buy anything new for and either recycle and repurpose other materials in order to finish it.